A place to showcase some of my projects, hopefully inspiring others that they too can be creative and have fun knitting, crocheting, and sewing. Whilst sorting through all my craft things, I came across a box with all my cross-stitch patterns and a number of projects in various states of incompletion. I pulled out an absolute treasure. Boy, did this send me on a trip down memory lane. I took it upon myself to educate my children in the finer aspects of crafts when they were younger. I tried to teach them how to knit, crochet and sew, which they went along with up to the point of frustration. Obviously lacking the same level of passion, they had varying degrees of success. If my son knew I was sharing this .... I would be so dead! I might as well go all out and put it up on my Facebook for fun. 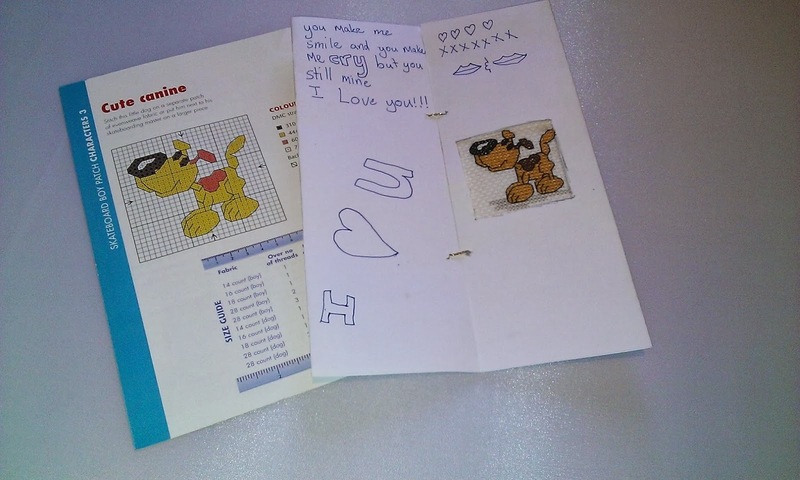 When he was about 9 or 10, I tried to teach him cross-stitch. Seeing as he liked animals, I gave him a really small dog to stitch. If I recall correctly, he did remarkably well, with me to the rescue only a couple of times. I'd forgotten he'd presented his completed project back to me in the form of a hand made card. I just had to share. On the back of his card he told me I Rock! If that doesn't warm the heart, nothing will. Copyright © 2013 Knit sum More. All Rights Reserved. Watermark theme. Theme images by merrymoonmary. Powered by Blogger.